The Waltz, now considered a modest, tame dance, was once considered a "shameless, indecent whirling dance... that broke all the bounds of good breeding". It had humble beginnings in rural Germany with peasants, who in 1580 or so were described as "dancing the godless Weller or Spinner", later called the Landler or Schleifer. The Weller refers to turning dances, and many of our familiar waltz tunes can be traced back to their yodeling melodies. The word 'walzer' and 'valtse' have their origin in the Latin 'volvere' which indicates a rotating motion. What was indecent about it? The partners danced face to face (a 'closed' dance position), with the man's arm around the ladies waist, sometimes so close that their faces nearly touched, and possibly their bodies were! While 'polite' society was dancing the Minuet, barely touched hands. In the 1700's, the waltz, in 3/4 time, spread across Europe in part due to the musical creations of Johann Strauss and Franz Lanner. By the 1800's and early 1900's Waltzes were everywhere, more relaxed and danced closer than ever before. The Viennese custom evolved to slightly anticipate the second beat of each measure, making it appear the third beat is late and adding a certain buoyancy. An American innovation was the 'hesitation', possibly inspired by the ballet chasse' step, halting on the standing foot for a full measure while sliding or moving the suspended foot. At the end of WW I, the popular Waltz was overshadowed by the Foxtrot craze and other dances. Today, there are two accepted forms known as the Modern (Slow) Waltz and the Viennese (Quick) Waltz. 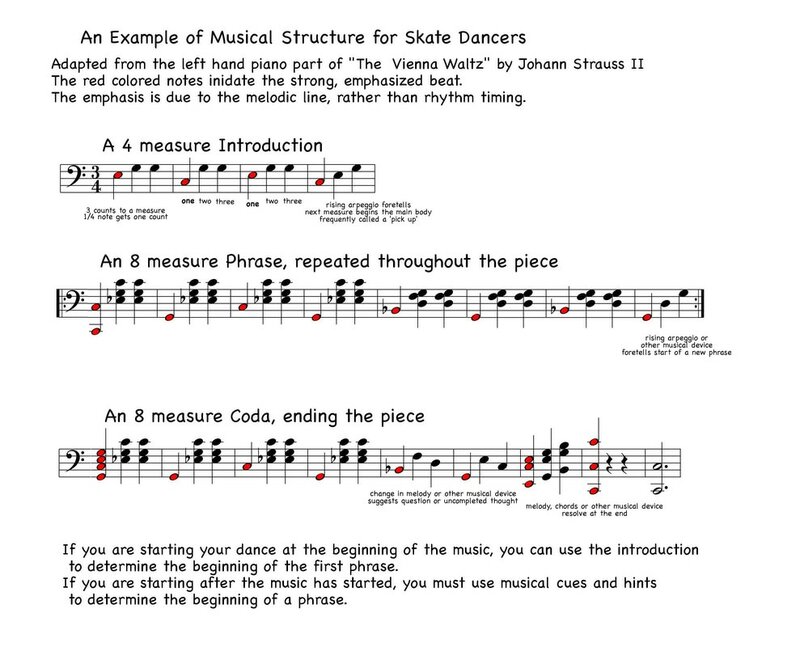 Key features of the Waltzes are: a 'closed' face to face position, many turns in that position, and the 'slow-and-slow' step timing pattern. The Waltz's original and most common timing is 3/4. Variations include 3/4, 3/8 and 6/8 (sauteuse) and 5/4 (5/4 waltz, half and half). ​It is counted ONE - two - three. An archetypical waltz is The Blue Danube Waltz (1867) by Johann Strauss II, used in the opening of the movie "2001: A Space Oddessy". Another with an even stronger expression of the waltz rhythm is The Vienna Waltz, also by Johann Strauss II. In this arrangement of the Vienna Waltz, there is a two note pick up (1 bar). Then at 0:03 the first phrase starts, and after 8 bars, at 0:11, the second phrase starts. Thereafter, phrases at about 0:20 and 0:30, for a total of 4, eight bar phrases. The metronome is set at about 164 BPM.